When parents and students walk into my center for the first time, I often chuckle to myself as they look in awe at all the kids swinging on swings, throwing balls, crashing into a bean bags and riding on our scooter board. I can hear the words in their head saying, “Did I come to the right place?” “How could this possibly be a learning center?” I can’t blame parents for being skeptical, after all, I would have thought the same thing if what my child needed was some reading tutoring or help with retaining their letters or math facts. Why would they possibly need to swing to read? Great point! What’s fascinating about the brain and the body is that they are connected, which many people don’t realize. What we are finding now is that because so many children are being less active and not getting the playtime they normally would have in kindergarten and first grade 20 years ago, their academics are suffering. Our goal may have been to compete with our international counterparts, but our kids are now falling backward instead of moving forward. And we are not the only ones out there who agree that more playtime is key to learning in the classroom. With all the recent articles in the Washington Post and New York Times about how more schools (especially in Finland) are implementing programs with occupational therapy, sensory toys and movement opportunities to help children develop their gross and fine motor skills, they are now seeing vast improvements in hand-eye coordination to track words on a page, improvements in core muscle strength used for attention and focus, retention of facts, letters and instructions given by the teacher (auditory), and stronger development of handwriting with fine motor skills. So if we’ve established that these types of activities actually help kids, how do we measure them? Each child is unique and different so how could we possibly “quantify” the results so more schools can start providing similar options? Well, let’s put it to the test! While I don’t always track the progress of my students by numbers and graphs, I do track how their performance levels grow over time. 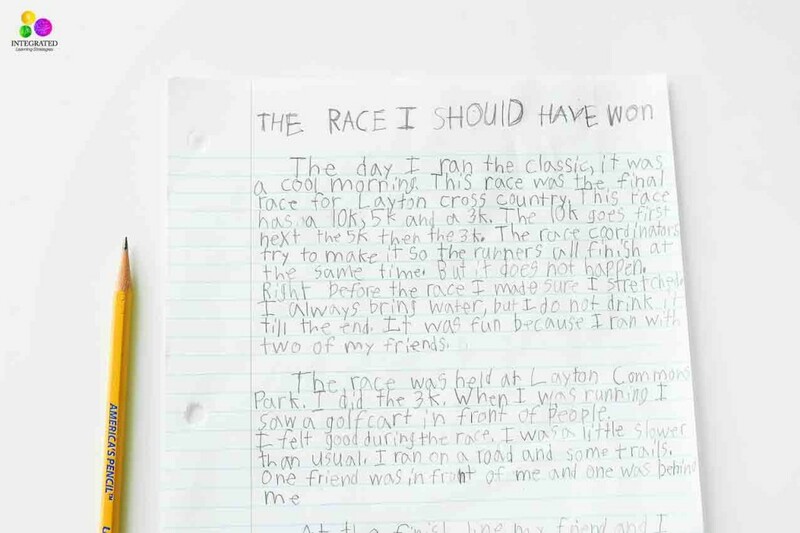 Awhile back, I had a young 8-years-old boy in third grade come to my office and his handwriting was almost unrecognizable. 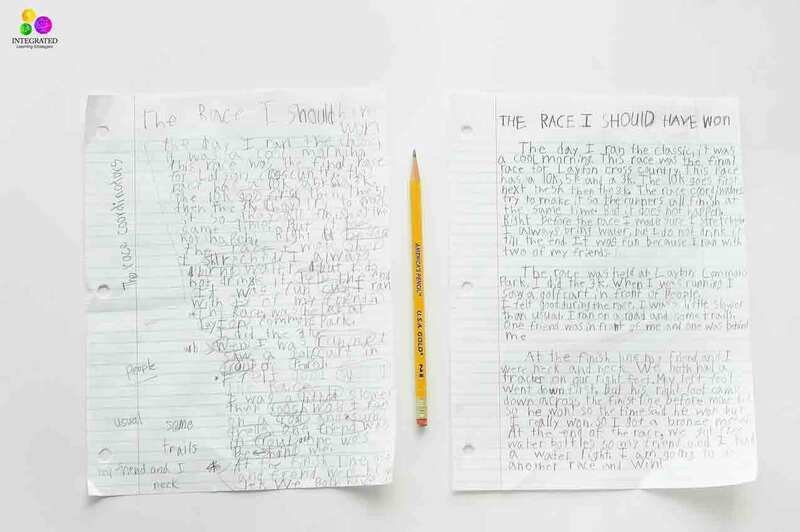 At that age, children are usually well on their way to writing paragraphs and sentences, however, this little boy’s letters were backward, he could barely grip the pencil and he was only able to write a few letters and words, not full sentences. As you know, handwriting is one of the fundamental building blocks for reading, communication, expression and test-taking. 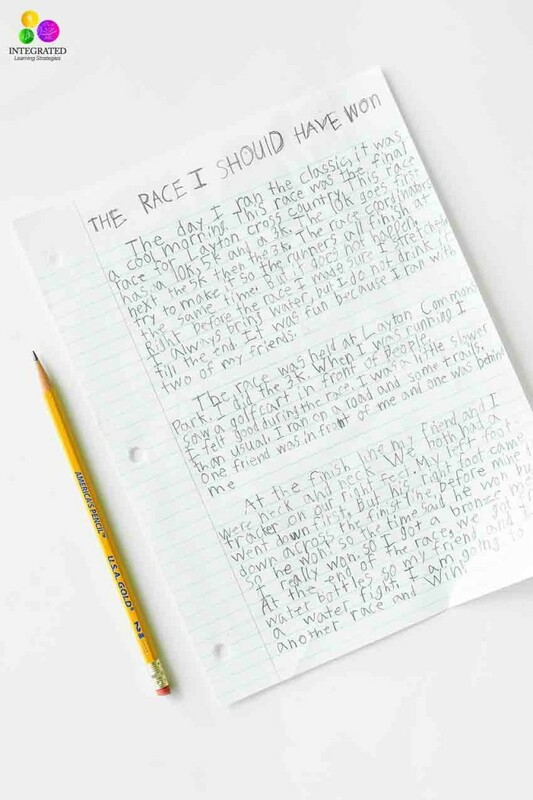 Effective writing helps children remember, organize and process information. As we teach our children to read and write, we should remember it isn’t just a matter of handing them a pencil and a picture of the letter “b” and telling them to write their letters. As you will see, letter formation is just as important as the handwriting itself. Here is what I mean. First, take a look at where our student began. You can see how some of the letters are backward; the tails of the letters are either above or below the lines and his writing curves downward instead of him writing in a straight line. These were all signs of poor fine motor skills and fine motor development. Before working on our student’s handwriting, we knew we had to incorporate movement and handwriting activities to stimulate the brain and the body for higher learning. After the initial meeting, we began incorporating activities to not only strengthen his fine motor skills, but his gross motor skills as well. 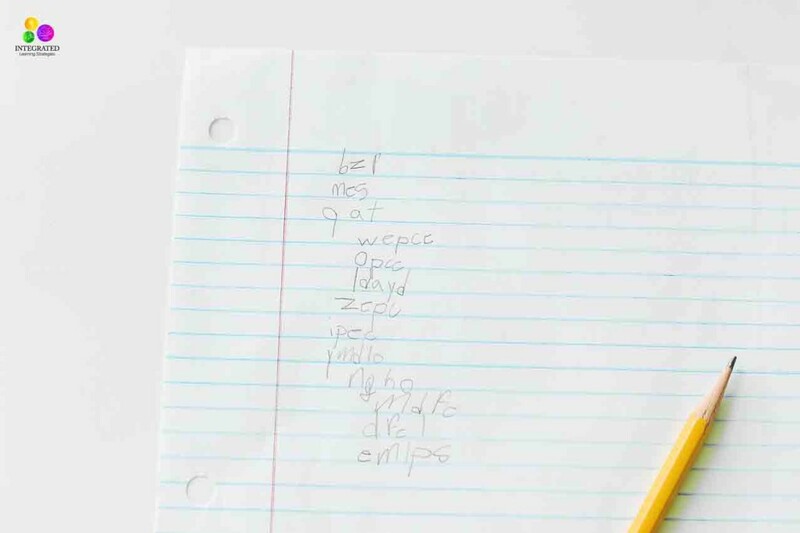 As we worked on improving his hand-eye coordination, core body strength and the muscles in the fingers and hands, we noticed significant differences in his retention of letters and sounds, letter formation, sentence structure and handwriting. Many of you can do the same with simple and fun games like you see here for fine motor skills as well as movement activities and animal yoga poses like you see here to develop their gross motor skills. 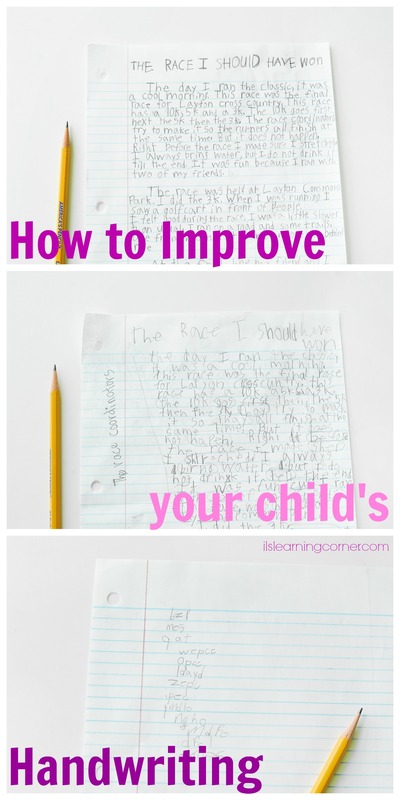 You can see the amazing improvement in his updated draft below just by working on developing the fine motor skills as well as the gross motor skills. Once we had strengthened his core muscles and the left and right hemispheres of the brain, his parents began noticing differences in his reading and writing. 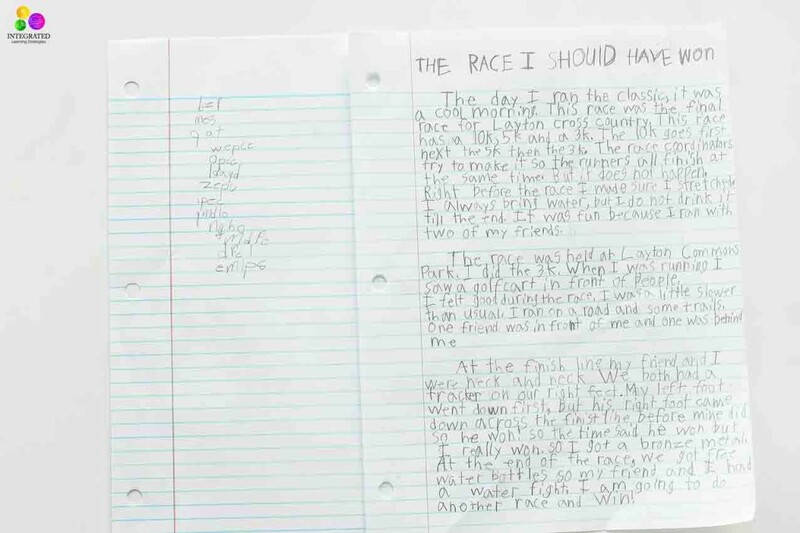 Now that we had improved the connections in the brain, we begin focusing on the details of his handwriting. Our next steps were to improve letter formation and sentence structure. 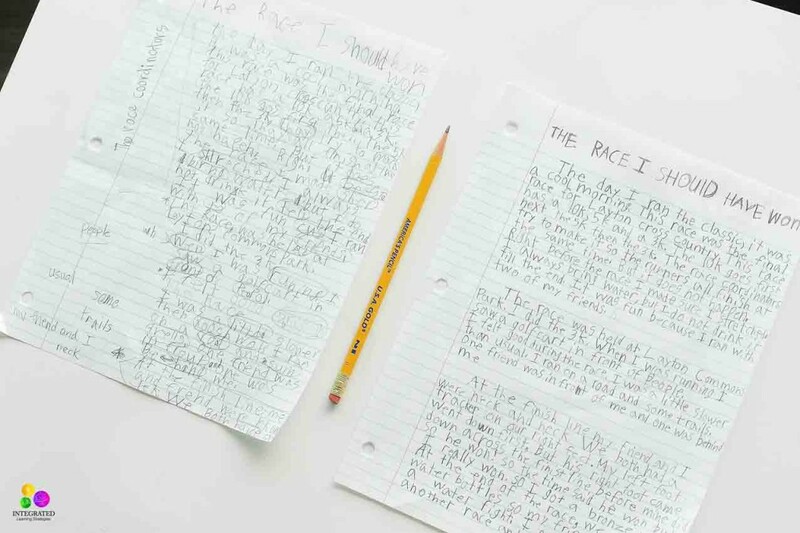 You may not think there is a right or wrong way to write as long as the letters get down on paper, but there is a huge difference in how it is connected to learning. 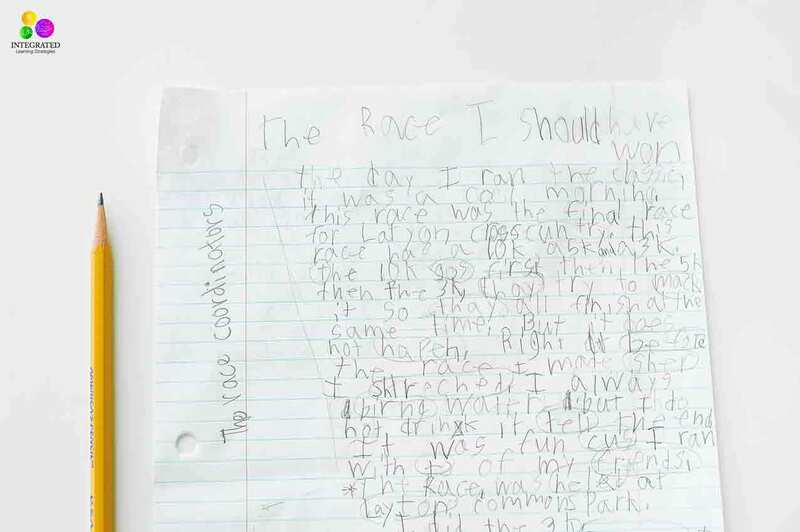 The first red flag you may see is your child writing their letters from bottom to top. Why is this important to correct? First of all, we naturally read top to bottom, right to left. By structuring our letters from top to bottom, we prepare our kids for reading more challenging and difficult books. It is also the way the brain functions. It needs that top to bottom, left to right movement for organizing the creative sides (right) and the organized sides (left) of the brain. As your child begins to improve their letter formation, then you can focus on the details of paragraph and sentence structure. Help them line their words and sentences in the left hand margin. 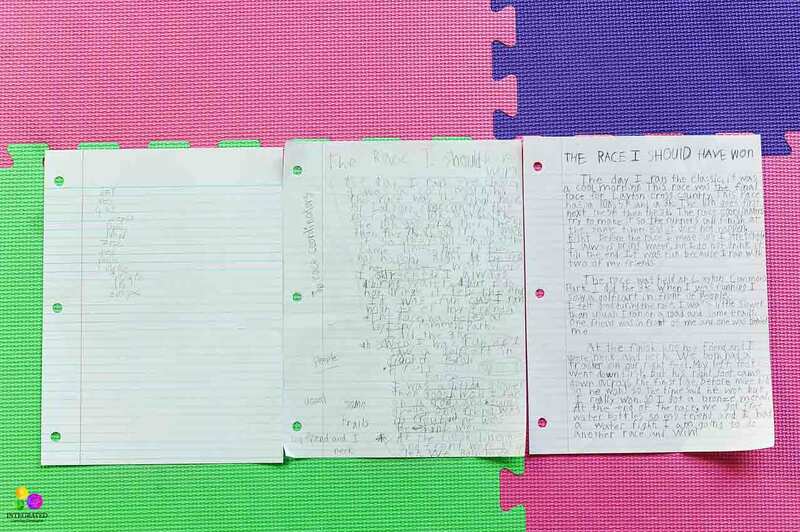 You can see the differences even from our student’s first draft to their final product and it looks amazing! 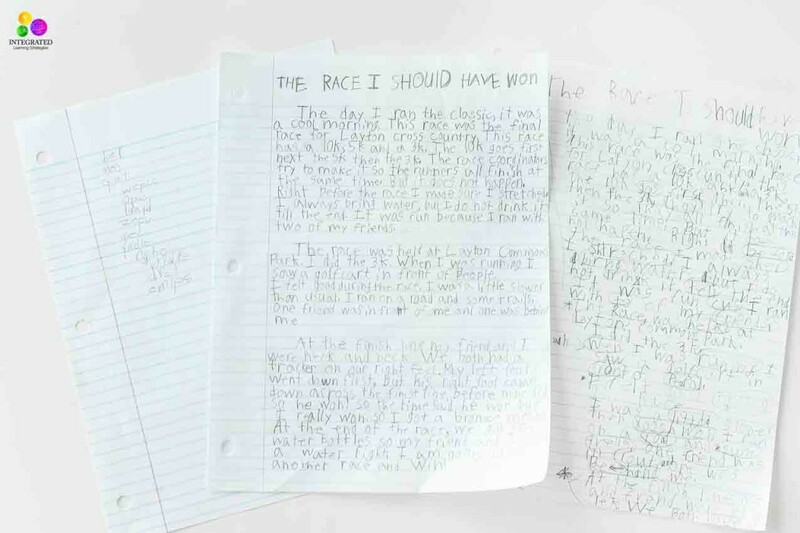 The results are undeniable and he is now in fifth grade as a thriving student, not only with his handwriting, but his reading, math, spelling and overall academic achievement. If you have a struggling child at home or in school, especially those with sensory issues, ADHD, Dyslexia, Autism and auditory processing issues, find ways to work on their gross motor skills and fine motor skills first (like you see here) before helping them with higher learning concepts. As you see in the articles above, playtime and movement is the key to cognitive development and excelling in the classroom. Original Article Source Integrated Learning Strategies is similar to Play2Learn in their dedication to helping children with learning disabilities achieve success.